Communities of color and working families in California have paid the highest price for dirty energy for decades — their health. Pollution from gas-fired power plants makes families and children sick. Polluted air and sick families lead to increased health costs. These costs only add to the struggle families face to put food on the table and pay their utility bills every month to stay cool during the hot summer months. Climate change only continues to exacerbate these challenges faced by working families every day. One visceral and immediate reminder of climate change is the increasing intensity of wildfires in California. As the 2018 California wildfire season roars in before the legislature has even adjourned, we see ever more vividly how growing climate disasters impact the most vulnerable. Farmworkers and day laborers toil outdoors in dangerous choking smoke. Immigrant families are left behind as basic disaster warnings and safety notices are not translated. Prisoners fight fires on the front lines for $1 an hour. Workers like housekeepers, caregivers, gardeners, and day laborers lose their jobs in evacuated and destroyed communities and have nowhere to turn for assistance. Thousands of impacted families are shut out of federal disaster aid due to their immigration status. As we face the ever-increasing impacts of climate change and burning of dirty fossil fuels in California, there is a statewide debate about who should be held responsible and how they should be held accountable. CEJA is playing an important role in shaping a bold vision for energy use and decision making in our state to ensure that low-income families already burdened by pollution are not saddled with higher prices for energy. Utility companies like PG&E cannot continue to shrug off their part in the conflagrations by getting the legislature to allow them to charge ratepayers —the public for— manager and investor’s failures. Advance a fast, and intentional Just Transition to 100% renewable energy that prioritizes disadvantaged communities and labor. 1. Are we protecting environmental justice communities? CEJA is a co-sponsor of a crucial bill this session, SB 64, which aims to prevent increased harmful air emissions from power plants, and increase transparency and accountability of fossil fuel generation in our communities. The majority of California’s gas fired power plants are in low-income communities of color. One hidden consequence of bringing more renewables online is that these power plants will start and stop more often to backup renewables, and a power plant can emit up to 30 times more pollution when it is starting than when it is operating continuously. Read this blog on SB 64 by our Executive Director Gladys Limon. Right now, this kind of increase in emissions is not being taken into consideration. SB 64 takes an important step forward by requiring a study of air emissions from gas-fired power plants and requires that the permitting process address these impacts. By bringing this data into the public space, Californians will have more transparent information to track how the changes in the use of power plants impact our communities. We need to phase out natural gas power plants by bringing more renewable energy into our grid – but we cannot let this process cause more pollution burdens in EJ communities. SB 64 protects low-income communities of color from paying the extra price for statewide energy policies. 2. Are we building a system that will transition California off fossil fuels? SB 64 is an important equity counterpart to SB 100, which would transition California off fossil fuels. SB 100 would change the Renewable Portfolio Standard to mandate that 60% of all electricity be generated from renewables by 2030, on our way to 100% by 2050. We want to see this target in our RPS because this will ultimately displace the use of fossil fuel generated electricity with wind, solar, increased storage and other renewable sources that won’t pollute the air our communities breathe. A requirement for 100% renewable energy will support our push for community-owned renewable energy projects that create jobs and economic opportunities. If public and investor-owned utilities need to procure more renewable energy, we will need to generate more and we can use the new RPS to foster locally controlled renewables. 3. Who is responsible for a changing climate and its disastrous impacts? CEJA opposes any bill that does not hold utility shareholders responsible for negligent behavior. Some current proposals for wildfire bills would give utilities a free pass by allowing them to claim exemptions for impacts by pointing to compliance with a disaster “plan” instead of having a case by case examination of actual fault for a fire. We believe that the grid must be maintained and be more resilient. We do not support any bill that allows investor owned or public utilities to recover the costs of improving and securing the power system unless it includes robust oversight and protects all existing ratepayer protections. The ongoing reliance of California utilities on burning fossil fuels is a top contributor to the climate crisis. Utilities spewed out over 429 million metric tons in greenhouse gases in 2016. Utilities are directly responsible for much of the wildfire devastation that California has seen in the past year. CalFire found that PG&E’s failure to properly maintain the grid was the contributing cause for the 12 Northern California wildfires in October of 2017, alone. In 2015, utility electric equipment and power lines were the cause of the fires that burned the most acreage. These wildfires have taken lives and devastated thousands of others. On top of all this, wildfire CO2 emissions already exceed the states successful reduction efforts. The National Park Service estimated that the 2015 fires released an additional 22.8 million metric tons of greenhouse gases into the atmosphere, compared to the 1.5 million metric ton decrease in credited to reduction programs the same year. Along with allies like The Utility Reform Network (TURN), we don’t see current proposed legislation enhancing safety, but rather as a bail out for utilities who will pass costs to ratepayers to deal with wildfire risk and recovery and abandon their responsibilities. Many communities who live in wildfire impacted areas are still struggling to recover, and we are far from being able to put adequate emergency systems in place, such as multilingual evacuation alerts, aid programs for immigrant families, and safety protections for farmworkers. We can build a much stronger, resilient, and equitable energy system by investing in community distributed generation. When wildfires struck Ventura and Santa Barbara Counties, hundreds of thousands of people were left without power when the utilities shut-off power lines. Those with access to generators could keep power running, while others scrambled for shelter and reliable power sources. Low-income families struggled as all of their groceries spoiled and those who couldn’t afford to evacuate remained in the dark. 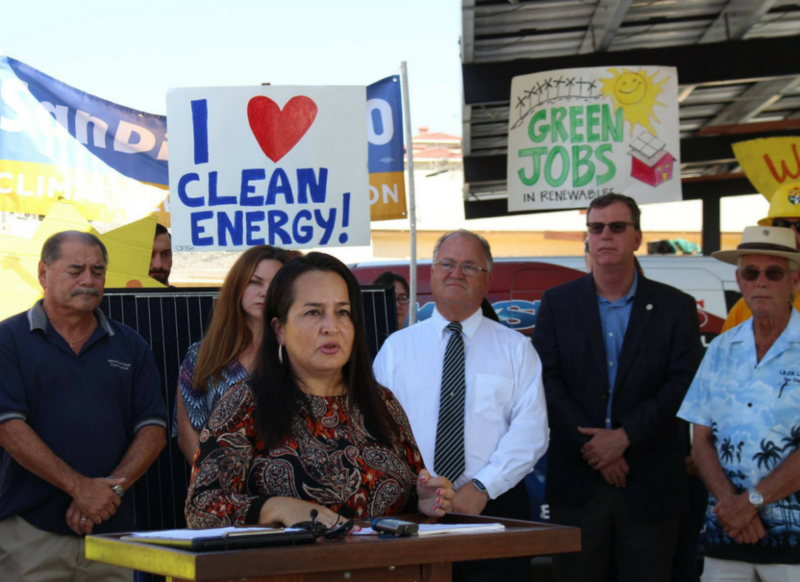 Instead, what if communities in Ventura and Oxnard had a community-owned microgrid powered by renewables and storage? In an event of a utility grid shutdown, the microgrid could continue to provide power to those who need it in emergency, while creating renewable energy and wealth opportunities for healthier neighborhoods throughout the year. 5. Can we defend community-led self-determination of our energy system? 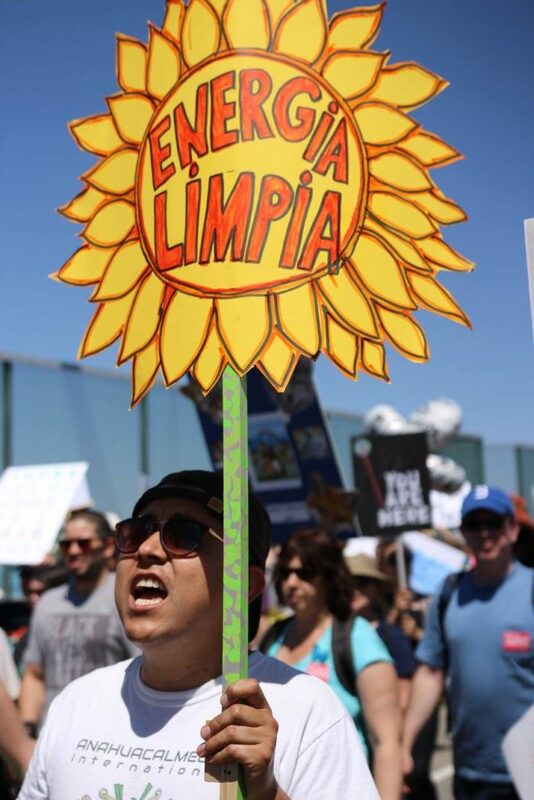 To protect Californians’ right to Energy Democracy and self-determination, CEJA opposes AB 813. AB 813 proposes to link California’s energy system with other western states. We are not opposed to more renewables and a more coordinated energy grid, but the bill utterly fails to address environmental justice concerns. AB 813 misses the localized and negative impacts of fossil-fuel generation in low-income communities and communities of color that we are seeking to address with SB 64. Without explicit safeguards, regionalization could increase localized air emission from gas-fired power plants that are used as backs up to renewables. Additionally, regionalizing the grid threatens the long work CEJA has pursued to create more renewable energy projects and jobs in disadvantaged communities. Too many low-income communities of color have been left behind without access to local clean energy and by moving away from local procurement or investing in local jobs communities will still be left out. Read this op-ed on our position on AB 813 in the San Diego Union Tribune. CEJA is also part of the Energy Democracy Tour, a national effort to promote work being done by communities around the United States, especially low-income communities and communities of color, to develop and control renewable energy resources to meet the pressing need of and empower their communities. The goal of the tour is to help knit together the movement to democratize energy to help build an Energy Democracy movement in the U.S. that showcases communities around the country that are creating energy solutions that empower their communities. This summer, California is already seeing massive heat waves and an early start to wildfires. Statewide solutions to speed the transition to renewables, protect vulnerable communities, and address the impacts of climate change are more needed than ever and must be rooted in community-led solutions. It is our responsibility to ensure the proposed solutions drive forward a just, equitable vision for Energy Democracy in our state.